Alice Malsenior Walker (born February 9, 1944) is an American author, self-declared feminist and womanist—the latter a term she herself coined to make special distinction for the experiences of women of color. She has written at length on issues of race and gender, and is most famous for the critically acclaimed novel The Color Purple, for which she won the Pulitzer Prize for Fiction. The style of the text was that of a traditional epistolary novel, but Walker created a unique work by combining it with the vernacular of black American English and with the struggle of a poor, uneducated black girl fighting both racism and black patriarchy in the setting of the American South. But I felt in Georgia and on the east coast generally very squeezed. People have so many hang-ups about how other people live their lives. People always want to keep you in a little box or they need to label you and fix you in time and location. I feel a greater fluidity here. People are much more willing to accept that nothing is permanent, everything is changeable so there is freedom and I do need to live where I can be free. Walker was injured when her brother accidentally shot her in the eye with a BB gun when she was eight-years-old. She became blind in her right eye as a result. This event had a large impact on Walker, especially when a white doctor in town swindled her parents out of $250 they paid to repair her injury. Walker refers to this incident in her book Warrior Marks, a chronicle of female genital mutilation in Africa, and uses it to illustrate the sacrificial marks women bear that allow them to be "warriors" against female suppression. After high school, Walker went to Spelman College in Atlanta on full scholarship in 1961 and later transferred to Sarah Lawrence College near New York City, graduating in 1965. Walker became interested in the Civil Rights Movement in part due to the influence of activist Howard Zinn, who was one of her professors at Spelman College. Continuing the activism that she participated in during her college years, Walker returned to the South where she became involved with voter registration drives, campaigns for welfare rights, and children's programs in Mississippi. In 1965, Walker met and later married Mel Leventhal, a Jewish civil rights lawyer. They were married on March 17, 1967 in New York City. Later that year the couple relocated to Jackson, Mississippi, becoming "the first interracial couple to be legally married in Mississippi." This brought them a steady stream of harassment and even murderous threats from the Ku Klux Klan. The couple had a daughter, Rebecca in 1969, but divorced eight years later, in 1977. Musician/Comedian Reggie Watts is Walker's second cousin. Alice Walker's first book of poetry was written while she was still a senior at Sarah Lawrence, however she took a brief sabbatical from writing when she was in Mississippi working in the Civil Rights Movement, after which she accepted a position at Wellesley College where she taught a landmark course on African-American women’s literature in the spring of 1972. Walker resumed her writing career when she joined Ms. magazine as an editor before moving to northern California in the late 1970s. An article she published in 1975 was largely responsible for the renewal of interest in the work of Zora Neale Hurston, who was an important source of inspiration for Walker's writing and subject matter. In 1973, Walker and fellow Hurston scholar Charlotte D. Hunt discovered Hurston's unmarked grave in Ft. Pierce, Florida. Both women paid for a modest headstone for the gravesite. In 1982, Walker would publish what has become her best-known work, the novel The Color Purple, an acclaimed 1982 epistolary novel that received the 1983 Pulitzer Prize for Fiction and the National Book Award. Taking place mostly in rural Georgia, the story focuses on the struggles of a young, black woman during the 1930s in the Southern United States. It addresses the numerous issues in the black female life as the protagonist, Celie, fights her way through both racist white culture and patriarchal black culture. The story is told through a series of diary entries and letters. Celie, is a poor, uneducated young woman who, at 14, is abused and impregnated twice by a man she believes to be her father. Through the course of events, Celie comes to know the truth about her situation, including the father of her children, and gaining power through her knowledge, is able to gain greater freedom and independence and successfully reunite with her sister. The novel was a resounding commercial success. The book became a bestseller and was subsequently adapted into a critically acclaimed 1985 movie as well as a 2005 Broadway musical play. Because of the novel's sometimes explicit content, particularly in terms of violence, it has been the frequent target of censors and appears on the American Library Association list of the 100 Most Frequently Challenged Books of 1990-2000 at number 18. Walker has written several other novels, including The Temple of My Familiar and Possessing the Secret of Joy (which featured several characters and descendants of characters from The Color Purple) and has published a number of collections of short stories, poetry, among other published works. Additionally, Walker has published several short stories, including the 1973 "Everyday Use: for your grandmama." This story contains Walker's traditional subjects of feminism and racism against blacks. Alice Walker's works typically focus on the struggles of blacks, particularly women, and their struggle against a racist, sexist, and violent society. Her writings also focus on the role of women of color in culture and history. Walker is a respected figure in the liberal political community for her support of unconventional and unpopular views as a matter of principle. In 2007, Walker gave her papers, 122 boxes of manuscripts and archive material, to Emory University's Manuscript, Archives, and Rare Book Library. In addition to drafts of novels such as The Color Purple, unpublished poems and manuscripts, and correspondence with editors, the collection includes extensive correspondence with family members, friends and colleagues, an early treatment of the film script for The Color Purple, syllabi from courses she taught, and fan mail. The collection also contains a scrapbook of poetry compiled when Walker was 15, entitled "Poems of a Childhood Poetess". In 1983, The Color Purple won the National Book Award and the Pulitzer Prize for Fiction, making Walker the first black woman to win this prestigious award. The novel was turned into a major motion picture directed by Steven Spielberg and starring Whoopi Goldberg. It received 11 Academy Awards nominations, but received no Oscars. A musical adaptation of the novel (based on the film) opened in 2005 at The Broadway Theatre in New York City. The musical received eleven Tony Award nominations, with LaChanze winning the award for Best Performance by a Leading Actress in a Musical in 2006. Walker also won the 1986 O. Henry Award for her short story "Kindred Spirits," published in Esquire magazine in August of 1985. 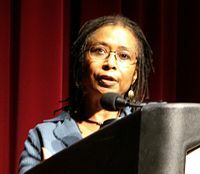 In 1997 she was honored by the American Humanist Association as "Humanist of the Year"
On December 6, 2006, California Governor Arnold Schwarzenegger and First Lady Maria Shriver inducted Alice Walker into the California Hall of Fame located at The California Museum for History, Women, and the Arts. ↑ 1.0 1.1 1.2 Campbell, Duncan, "A long walk to freedom", 'The Observer', February 25, 2001. Retrieved Retrieved January 20, 2009..
↑ Gerri Bates, Alice Walker: A Critical Companion (Westport, CT: Greenwood Press, 2005, ISBN 0313320241). ↑ White, Evelyn C., "Alice Walker: On Finding Your Bliss; Interview by Evelyn C. White", Ms. Magazine, September/October 1999. Retrieved Retrieved January 20, 2009..
↑ "Inner Light in a Time of Darkness: A Conversation with Author and Poet Alice Walker", Democracy Now!, November 17, 2006. Retrieved January 20, 2009. ↑ The day feminist icon Alice Walker resigned as my mother. Retrieved January 20, 2009. ↑ How my mother's fanatical views tore us apart Retrieved January 20, 2009. ↑ Teagarden, Rebecca, "Reggie Watts", 'The Seattle Times', December 19, 2004. Retrieved January 20, 2009. ↑ "Speaker Reﬂects on Alice Walker, Time at Wellesley" Wellesley Week (April 9, 2007). Retrieved April 26, 2011. ↑ Extract from "Anything We Love Can Be Saved: A Writer's Activism" by Alice Walker published by The Women's Press Ltd, 1997 Retrieved January 20, 2009. ↑ The 100 Most Frequently Challenged Books of 1990–2000. American Library Association. Retrieved January 20, 2009. ↑ Elaine Justice, "Alice Walker Places Her Archive at Emory" Emory University News, Dec. 18, 2007. Retrieved April 9, 2011. This page was last modified on 7 March 2016, at 21:53.